Are you ready for tax season? Although April is still a bit of a way off, it's never too early to start preparing your tax returns. Way too many people push off filing their taxes until it is too late and they have to deal with the stress of the last-minute tax rush. Now that the benefits of early tax planning are clear, let's go into five tips to help you get ready for tax season. Give yourself enough time to get yourself organized. This starts with making sure that you have all of the documents that you will need. Whether you are an employee, are self-employed or employ others, you will need time to gather your records and make sure that you have all of the necessary forms. For example, if you are a freelancer, make sure that you have all of your 1099s ready before you file your taxes. Many people are unaware that there may be deductions and tax credits available for them. Many of these deductions are overlooked, and they can add up in the long run. If you are an individual, make sure that you are making the most of any charitable donations that you made over the past year. You may be able to deduct payments that you made on state income or sales taxes. Child and dependent care credits are further examples of possible credits. If you are married, there are further deductions that you may be able to take. If you are self-employed, you may be able to deduct certain things as business expenses. For example, if you have a home office or computer that is used for work purposes, it may qualify as a business expense, depending on what your main use of it is. If you own a small business, consider credits such as healthcare tax credits and energy credits. Take a look at your previous year's tax returns. For most people, not much changes from year to year. 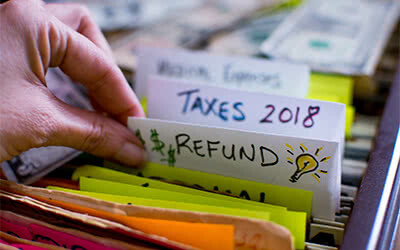 You can use last year's returns as a point of reference to help you make sure that you are not forgetting anything on this year's tax returns. There are many ways to file tax returns. Many people opt to use online software such as TurboTax to file their returns. If your tax returns are simple, this may be the best option for you. However, if you are self-employed, own a business, or otherwise have a more complex tax situation, consider enlisting a professional CPA to help you prepare your returns and file them with the IRS. Finally, set a plan for next year's taxes. As we said, it is never too early to start preparing your tax returns. If you see that you could have done better in terms of accounting, paying estimated taxes on time, or otherwise preparing for your taxes throughout the year, make plans to change your habits over the course of the next 12 months.